Hi Everyone, today is Thursday and you know what that means? 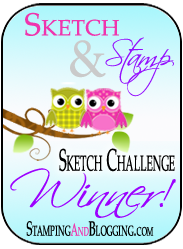 Another Happy Stampers Blog Hop. Our team is having so much fun creating cards for you each week. This weeks challenge was a sketch. I can’t wait to see what everyone created and how they made this sketch their own. I decided to use “Lovely As A Tree” stamp set. It is a classic Stampin Up set that has been around for years. Because of the timeless design it will never go out of style. Would you believe that I ordered this stamp set over a year ago and this is the first time I have inked it up. What was I thinking? I love this set and I know that I will use it over and over again. Another first for me was designing a BLUE Christmas card. I seem to gravitate toward the red and greens but today because of the stamp set, I went blue. What do you think? I used my 1-3/8 circle punch and punched out a circle on a piece of post it tape as a mask for the moon. I adhered the mask and started sponging at the bottom with soft sky. I left the center open with no color added and then sponged the top with more soft sky. When the color was the shade desired I moved onto Pacific Point ink and sponged the edges and the upper sky just a bit. You then pull the moon mask off and you have a beautiful moon. This card has the fir tree from Lovely As A Tree stamped on the left hand side of the card in Black Momento ink. After the tree was inked some snowflakes were added using Versa Mark ink. White embossing powder was then sprinkled over the top, the excess taken off and the final step was heating the snowflakes with the heat tool. After the stamping was done on the art piece I wrapped the silver cord from the holiday catalog around the bottom on the piece adhering it with some glue dots. After cutting your circles, the sentiment from the “Reason for the Season” stamp set was stamped with the ink to rubber technique. Meaning, I used my stampin up markers in soft sky and pacific point to color the saying and then stamped it on my white circle. The last steps for the card were to add a double silver cord bow with a glue dot and my card would not be done until I added a bit of bling, rhinestones to be exact. I could not resist to ink more of the stamps from “Lovely As A Tree” and made a little scene at the base of the inside of the card. The sentiment was done with the ink to rubber technique just like the one on the front of the card. The inks were again soft sky and pacific point. This entry was posted in Christmas, Stampin Up - Lovely As A Tree. Wow! Beautiful card! You ladies are killing it with this blog hop! Thank You Kathy, it is fun to see what everyone makes. Beautiful card Kristi, lovely color combo, and I LOVE the inside too, beautiful job….. Thanks Sandi, my first ever blue Christmas card! Thanks Mary, we were both thinking blue this week. Beautiful! Love the soft colors, perfect for the winter scene that you’ve created. Fabulous card! Thank You Amy, my first blue Christmas card, wont be my last. Wow, this is stunning! I, too, love the cool crisp colors. The inside of your card is great, too! Thank you Jari, love that stamp set! Love the glitter and the winter feel. And of course my favorite stamp set!!! Great job. Thank you Shelagh, it was fun to make. The glitter just adds that added sparkle. Oh and the inside is fabulous!!!!!! Thank you Heather, my first blue Christmas card.